TrendXplorer has been so generous in sharing his scripts, I thought I would share something in return I have been working on with him recently. It is a trend indicator based upon the Keltner Channel, with a Bollinger PercentB like concept, I have named KC_PercentK. 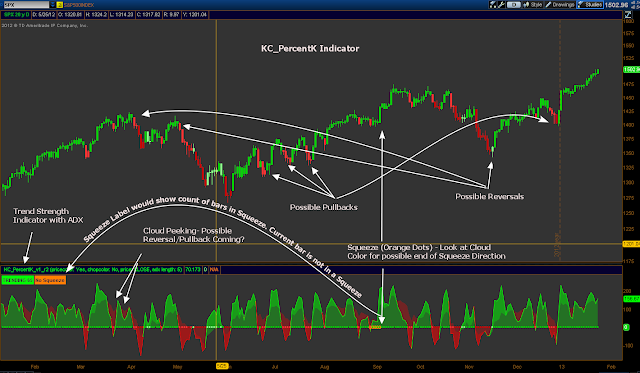 However, it uses a short term (6,0.5) and a long term (20,1.5) PercentK to determine the trend. As a sequel to my post of last Sunday about a statistical framework for technical indicators, this post is about a technique how momentum indicators help to identify a bull or a bear market. For this technique we'll assume that a momentum indicator can sustain a bullish or bearish mode for a prolonged time. This behavior was introduced to me by Zev Spiro CMT in his daily market letters. Zev distinguishes a bullish mode when the RSI breaks above the bearish resistance level of 65. When in bullish mode the 40 level acts as bullish support. 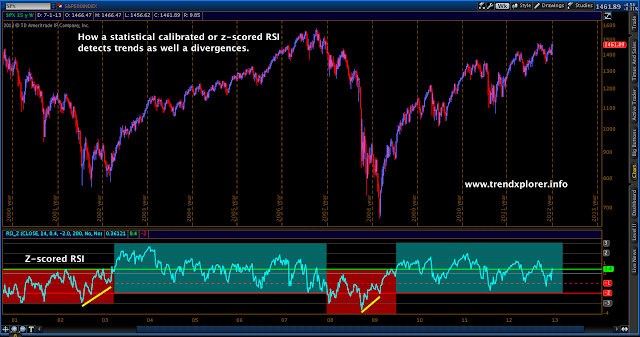 So during a bull market the RSI may fall down to this 40 level as long as it doesn't cross below this level. When RSI breaks below the bullish support level of 40 a change of trend is assumed and RSI has shifted into it's bearish mode. 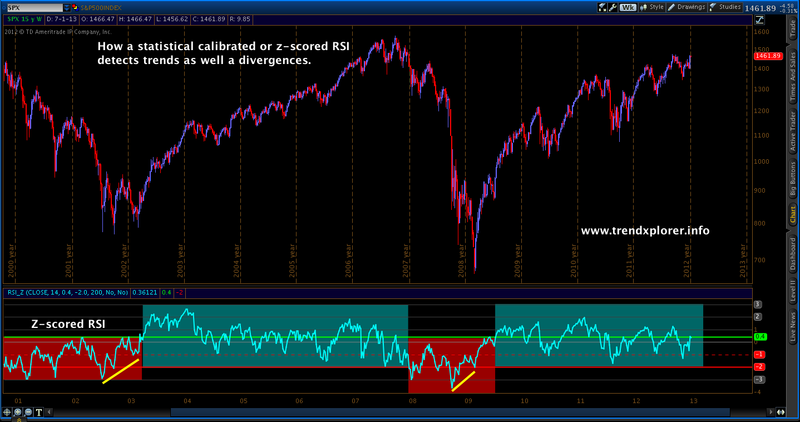 See the chart below for an example on a long term weekly chart of SPX. Instead of the usual RSI the z-scored version is used and please note the support and resistance sigma levels are manually calibrated, unlike Zev's fixed levels. After 16,000+ page views in the last year, I'd like to take advantage of this opportunity to thank all of my visitors and followers for their continued interest and support. And while today is the Twelfth Night or Epiphany it's also just in time for wishing everyone a profitable, prosperous and healthy New Year. Now over to the subject of this posting. In 2010 a former software engineer at Intel Corporation by the name of Michael Gutmann published an article on "A Statistical Approach to Technical Indicators". Gutmann also wrote a book titled "The Very Latest E-Mini Trading: Using Market Anticipation to Trade Electronic Futures." In his article Gutmann illustrates a method of converting technical indicator outputs from asset-specific values to statistical measures of price extension and compression. He stated that the results of such indicators can be used across markets without modification. The data’s mean, or average, referred to with the Greek letter μ (“mu”), is first calculated. The data’s standard deviation is then calculated as the average distance of the data set from its mean. The standard deviation, referred to with the Greek letter σ (“sigma”), is easy to work with because it takes values that are the same units as the original, underlying data. The science of statistics has determined that for many naturally occurring populations (population height, weight, test score, etc. ), data is “normally” distributed about its mean. 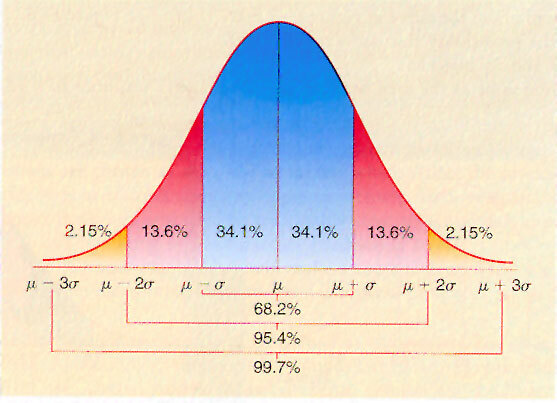 This is the well-known bell curve of population distribution. Interestingly, bell curves are completely defined by their mean and standard deviation. This allows one to say that a normal distribution has approximately 70% of its data contained with one standard deviation of its mean and 95% within two standard deviations, regardless of the values computed for the data’s mean and standard deviation.